The animal kingdom harbors many parenting secrets. Compared with humans, animals have both unique and similar ways of parenting their offspring. For instance, elephants rely on young females to act as babysitters for their young calves–sound familiar? Not everything animal parents do is identical to human parents. For instance, the Panda bear commonly gives birth to two babies but she only raises one. Before you go thinking Panda moms are callous and cruel, it’s not that at all. Instead, out in the rough and tough wild mothering one baby requires all of the resources a Panda has to offer. Her decision boils down to one healthy baby or two weak babies. Not everything is bleak out in the wild, in fact few things are. It appears animals enjoy raising their young just as much as us furless humans! Check out these photos of the cutest parenting moments in the animal kingdom to see just how much fun animal families have living life on the wild side. This Polar Bear cuddles her baby close, her thick claws and foreboding paws keeping a tight grip on her sweet little cub. David Lazar shot this stunning image of two lionesses living in the Masai Mara game reserve in Kenya. The two adoringly gaze at their baby sibling, with pride often reserved to parents. This mama helps her baby to stay afloat as they go for a swim in the waters they call home. How about a nap now? Baby squirrels are so small and hairless you can hardly tell what they are–but this mama knows her baby when she sees him. What is under this mommy’s colorful wings–2 sleepy chicks! This is one strong possum carting around 6 babies on her back, while simultaneously scaling a fence–you go mom! 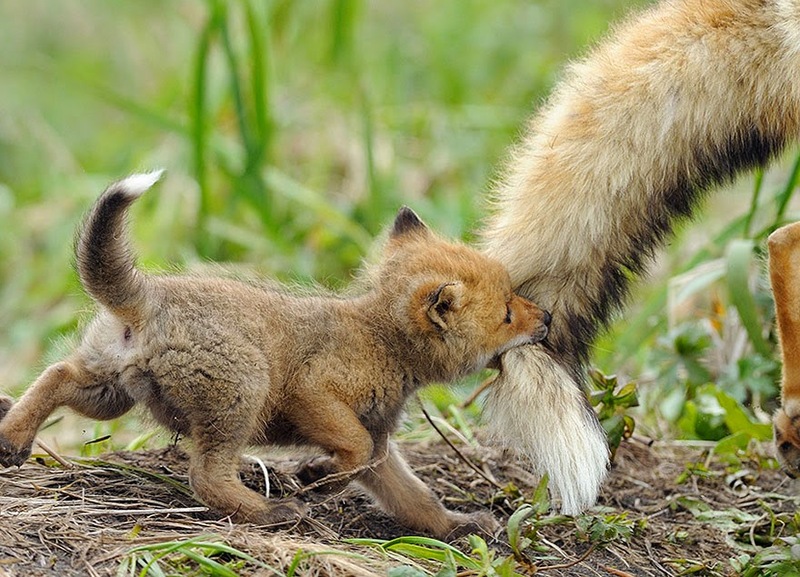 “Wait up Ma!” This Fox hollers, clinging tight to his mommy’s bushy fox tail. Elephants are the only other species (besides us humans) that visits the graves of their deceased loved ones. You can only imagine how much love elephants have for their offspring. This adorable pair link trunks as they travel onward. How Bear-y cute are these two?! Parents always know best–this loving mother swan tucks her babies under her wings where they will stay warm and dry while traveling across the pond. Crocodiles are not often considered “cute” but despite their scaly skin and forbidding sharp teeth, turns out they are family-orienated! Udayan Rao Pawar, was voted Wildlife Photographer of the Year in 2013 after he snapped the photo below of a croc family. He camped out on the banks of the Chambal River in India in order to see 2 gharial crocodile colonies. While the animal sightings at the Chambal River are incredible, the area is threatened by illegal sand-mining and fishing. Play Time! This big mama finds her baby cub’s ticklish spots! Penguins use a buddy system to help watch over their young, adults take turns forming groups around baby penguins in order to keep them safe and warm. No butts about it, these two are definitely related. As mom and dad share a passionate embrace, the little one begs for some attention around here. Peek-a-Boo–Did someone say FISH?!?! These two grizzly bears play in deep water, baby isn’t afraid, she knows she has her mom there to protect her. Papa bear teaches his cub some things he doesn’t want mom to know about when they get back to the den later. Has anyone seen my baby chick? While mama hunts for some food, baby decides now is a nice time to take a nap. When you become a parent (human or animal) you realize that the one thing greater than enjoying a good meal is feeding a good meal to your children. You might think this bird has one too many legs, but think again….